Ilda has a large client list consisting of both celebrities and royalty. Ilda’s brand has achieved a cult status worldwide making a name for itself in the highly selective and competitive market. Due to the recognisable unique designs, Ilda has been sought after for high profile occasions and is the preferred milliner for Royal Ascot dressing the face of Ascot every year as well as working alongside Longines (official timekeepers at Ascot racecourse) providing their Ambassadors with hats every year. Ilda’s has a high profile business and a high profile social life being invited to celebrity events, red carpet events, judging competitions, working with fashion shows, charity events and launch parties, Ilda’s designs also appear at royal weddings. Each design is handmade at Ilda’s Sunningdale studio and all hats and headpieces are can be dyed to match all outfits. Ilda’s design philosophy encourages pieces that stand out, look individual and continually inspire the imagination of those who both see and wear them. 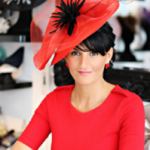 Ilda is sought after for her honest and candid opinions on hats, offering advice on how they should be worn, styling for individuals and how to avoid mistakes when selecting headpieces.